#Packers QB Aaron Rodgers completed each of his six passes on that drive for 72 yards and a TD. Remember that drive. At this point, #Packers QB Aaron Rodgers is 21 of 30 for 266 yards, two TDs and 0 INTs. Oh, and No. 1 WR Jordy Nelson isn't playing. #Packers come out firing to start the second half! 3-yard TD from Rodgers to Cook caps off the scoring drive. 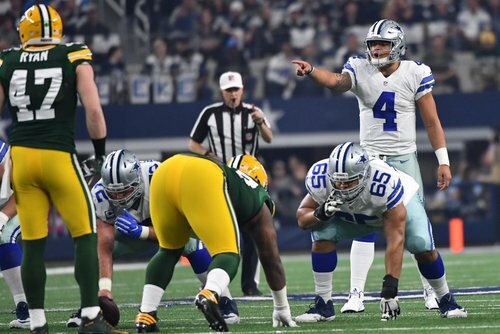 A heck of a play from Dak Prescott, finding Jason Witten as Nick Perry drug him down. Takes some strength to get that pass off. Cowboys CB Claiborne (rib) return questionable. Without Burnett, Josh Hawkins is in on the dime. Hawkins the No. 4 CB in dime now with Burnett out, Burnett had been moving up to slot in dime. Big play by Dak Prescott on third down. #Packers have kept Cowboys out of the end zone most of the day. Need to hold to another field goal. 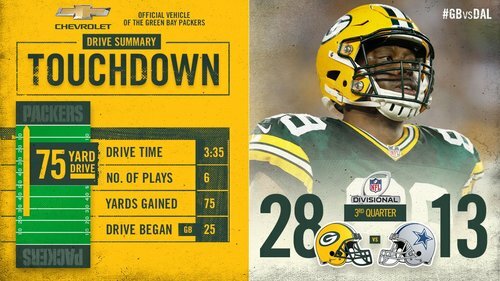 Micah Hyde, Dak Prescott's apparent intended receiver, makes the #Packers defensive play of the game. #Packers S Micah Hyde sure knows how to have a contract year. What a play by @micah_hyde ! PICKED! @micah_hyde going the other way! Before that INT, #Packers QB Aaron Rodgers had thrown 24 TDs and 0 picks in his last eight-plus games. A terrible time to end that streak. The interception streak is over. Rodgers threw deep for Davante Adams, and safety Jeff Heath swooped in for the pick. Big play for Dallas. Rodgers had gone 318 straight passes without an interception before that pick. Kenny Clark, playing like a first-round pick, strings out Ezekiel Elliott on the screen in open field. Athletic play for #Packers D lineman. #Packers QB Aaron Rodgers had gone 318 attempts without an interception.